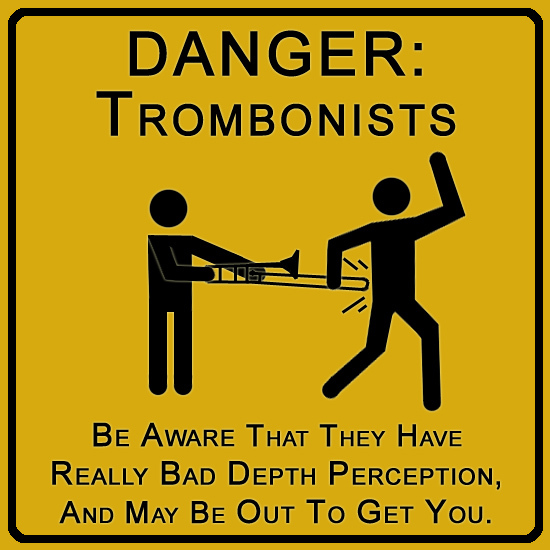 Made for my sister, after she got hit by a trombonist in a similar fashion. I thought it made a funny story/situation, so I made this. Making the little people look right and still be expressive is harder than you'd think. Also, making a trombone stand out is next to impossible, so I gave everything just a tiny bit of glow so they'd stick out better. It's cheating, but it works. In retrospect I should have made the sign diamond shaped and stuck a photograph behind the design, but I didn't. I probably shouldn't have tried to get the perspective distortion in there either. I should think of a subtle and cunning way to emphasis the "Out To Get You." Because they are. Oh yes, they are.